Can Trump Be Trusted With Nukes? Joe Scarborough, co-host of “Morning Joe” on MSNBC, recently revealed a conversation with an unnamed foreign policy expert who had met with Donald Trump. Reportedly Trump asked the expert several times about the conditions under which the U.S. might use nuclear weapons. Trump asked, “Why can’t we use nuclear weapons?” according to Scarborough’s source. Mainstream media heads explode at the mere mention of nukes. Huffington Post called Trump’s reported questions “truly, shocking.” Slate called them “incredibly frightening.” Wired offered their thoughts on the “ethics of deploying nuclear weapons on entire civilizations.” For the record, Trump wasn’t talking about all-out nuclear war on an “entire civilization.” He was talking about the selective use of nuclear weapons in certain conditions. Commentators said this proved Trump was unfit for office and was unbalanced. The idea of having Trump’s fingers anywhere near the nuclear button was already scary to inside-the-beltway types, but these reckless questions proved the point beyond doubt. Within days of the Scarborough reveal, 50 prominent Republican national security experts signed an open letter saying they could not support Trump and found him “not qualified” for office, and “dangerous”. Whether this was in direct response to Trump’s nuke comments is unclear, but the juxtaposition was unmistakable. Had Trump finally crossed the line beyond redemption? Actually Trump’s questions were highly intelligent and properly nuanced in light of America’s current nuclear war-fighting strategy. I’ve studied nuclear strategy since the late 1960s, starting with the game theoretical work of Henry Kissinger and Herman Kahn, and continuing with the arms limitation efforts of Paul Nitze. Americans acquainted with nuclear war-fighting have heard of MAD. That stands for mutually-assured destruction. MAD evolved over the 1950s and 1960s as a way to create a stable equilibrium in the nuclear arms race. When nuclear weapons were first deployed, there was a view that a first-strike by either the U.S. or the Soviet Union (now Russia) could incapacitate the opponent and win the Cold War. This view led to a highly unstable situation; there was continual pressure to attack before being attacked. As a result, each side built up their nuclear armaments to create a “second-strike” capability. That way if you were attacked first, enough weapons would survive to strike back. This second-strike would deter the first-strike since the attacker had as much to lose as the victim. 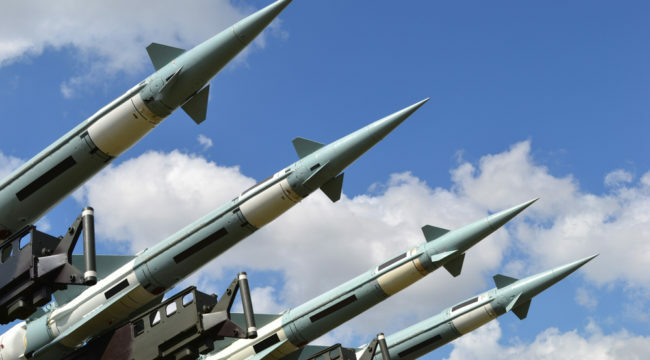 The problem with second-strike theory was that each side continued to build first-strike weapons, especially multiple warhead missiles, to eradicate the second-strike capability. Each side also built more weapons to increase second-strike survivability. The line between first-strike and second-strike weapons became blurred. The nuclear arms race was spinning out of control. Eventually arms limitation treaties and the existence of the nuclear triad (land, air, and sea launch capability) established a balance of terror. Each side had enough weaponry to survive a first-strike, and the parties agreed not to expand those capabilities. An ad hoc combination of game theory, armaments, and treaties resulted in the stable equilibrium of mutual assured destruction, which has kept the nuclear genie in the bottle for forty years. This was the crowning strategic achievement of the Cold War. This begs the question: if you have a stable balance with second-strike capability, why not renounce a first-strike? This pledge of “no first use” of nuclear weapons has already been made by China and India. The Soviet Union also made the pledge and pressured the U.S. to do likewise, although Russia reversed that pledge in 1993. Today Russia and NATO both reserve the right to the first use of nukes. The U.S. also reserved the right to first use until 2010. That year, President Obama announced a partial “no first use” policy. He said America would not use nuclear weapons against non-nuclear powers that agreed to the Non-Proliferation Treaty and honored their obligations. However, a potential first use policy was retained against nuclear powers such as Russia and China, and non-compliant states like Iran. This brings us to Donald Trump’s questions. Asking how and why nuclear weapons might be used shows a subtle appreciation of U.S. military doctrine. It’s a critical question. Trump should be applauded for asking it. When might the U.S. launch a first-strike? Consider this scenario. The regime in Iran has an apocalyptic theology based on the return of the “Hidden Iman” who will lead the world into an age of universal peace following a phase of death and destruction. A course of action that creates mass death is viewed by Iran as hastening the longed-for return of the Hidden Iman. In addition to its uranium enrichment, Iran may have pursued biological warfare. This is far easier to do, and more difficult to detect than uranium enrichment. What if U.S. intelligence learned that Iran planned the imminent release of a highly contagious deadly virus on U.S. soil? This virus has been secretly created by Iran in hardened laboratories buried deep underground where conventional weaponry cannot penetrate. Assume U.S. intelligence assessed that 50 million Americans would die before effective quarantines and treatments could be put in place. The virus will be transported from its current underground hot zone to the U.S. by an unidentified courier on a commercial airline. The release of the virus is imminent, possibly within days. The hardened laboratory makes it impenetrable for special operations. A division strength attack would be needed, but there’s no time to launch a Marine Expeditionary force before the virus is released. The President is in the situation room with the National Security Council, joined by video with the Joint Chiefs of Staff, the Director of National Intelligence, the Director of the CIA, and medical experts. The President is advised that a surgical strike using low-yield tactical nuclear weapons would obliterate the underground laboratory and render the virus harmless before it can be released. There are no other timely or effective military options. I know what I would do. I’d use tactical nuclear weapons and save 50 million American lives. This choice is not entirely hypothetical. President Truman faced the same decision in ending World War II. The War Department estimated 500,000 Allied casualties as a result of an amphibious invasion of Kyushu, the start of an attack on the main home islands of the Japanese Empire. The Japanese had established a pattern of fighting to the death in Okinawa and elsewhere. Counting Japanese casualties, a death toll of a million or more is not far-fetched. Truman ordered a strike with atomic weapons that quickly ended the war. These scenarios are not pleasant to think about. Herman Kahn’s classic work on the topic is called “Thinking About the Unthinkable.” But, serious strategists have engaged in this work for decades. Donald Trump’s question about how and why the U.S. might use nuclear weapons is a serious effort to understand a critical issue, and entirely consistent with U.S. strategic doctrine. I would be more troubled by a potential Commander-in-Chief who was not asking these questions, than one who was. Trump gets ridiculed for not being inquisitive, and then gets ridiculed again when he is. The media can’t have it both ways. In their rush to mock Trump, commentators like Scarborough reveal their own lack of acquaintance with the issues, not to mention their obvious bias. I doubt Scarborough’s sidekick, Mika Brzezinski, could have helped him avoid embarrassing himself, but her father certainly could have. Dr. Zbigniew Brzezinski is a Professor of International Relations at the Paul Nitze School of Advanced International Studies where strategic thinkers like Hal Sonnenfeldt (known as “Kissinger’s Kissinger”), and Robert W. Tucker taught for decades. I know, I was their student. At least one Brzezinski would have understood that Trump asked the right question. Ed. Note: Sign up for your FREE subscription to The Daily Reckoning, and you’ll start receiving regular offers for specific profit opportunities. By taking advantage now, your ensuring that you’ll be financially secure later. Best to start right away.